Choosing the right new gaming monitor can be intimidating for many users as there are many options and specifications to take into consideration. 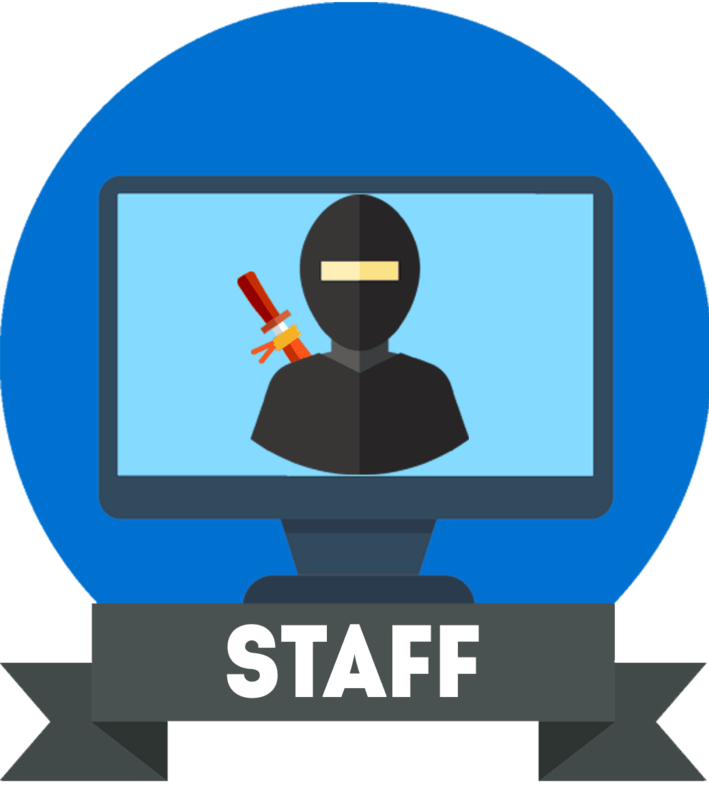 To fully utilize the latest video games, you will not only need a gaming PC with a powerful graphics card and CPU, but you will also need a proper gaming monitor that will be able to take advantage of all that. In this guide, we will thoroughly explain everything you need to know about gaming monitors and what to look out for in order to ensure that you’re getting the right monitor for your needs and preferences. What monitor size/resolution is for me? Which panel type is for me? When it comes to the best monitor size for gaming, bigger is not always better – you also have to take pixel density into account. Pixel density is a pixel per inch ratio of the monitor’s resolution and size. If a monitor has a too low pixel density, the image quality will be pixelated which means there will be limited screen space as well as lack of details. In case it’s too high, there will be a lot of screen space and details but you will have to scale the image up in order to for small text to be big enough to read it. While this isn’t a problem itself as you can choose whether you want to sacrifice screen space for larger and crispier details or not, some applications including video games have poor scaling or no scaling ability at all. This means that in some games that don’t support scaling, certain in-game elements such as the HUD will be too small. Luckily, most new games support scaling just fine. So, double-check how your favorite apps handle scaling if you decide on a display with a high pixel density. In short, most people are satisfied with 27″ screens. They are reasonably big, but not too big that you’d have to move your head from one corner of the screen to the other in order to catch all that’s happening on the screen. The ideal resolution of a 27″ monitor is 2560×1440 (WQHD) which results in a pixel density of ~109 pixels per inch. You get the perfect amount of screen space and details without any scaling necessary. In contrast, a 27″ 1080p (1920×1080 – Full HD) monitor has a pixel density of ~81 PPI which means you get little screen real estate and pixely picture quality, though some users don’t mind this as they’d rather have a bigger screen than a clear and sharp picture quality. These are the optimal monitor size/resolution combinations. Of course, you need to make sure that your CPU/GPU will be able to handle the monitor’s resolution at its maximum refresh rate which brings us to the next specification that you need to consider. 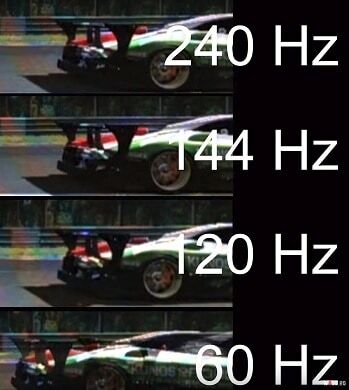 In the video above, you can see how different refresh rates affect motion clarity. The higher the refresh rate the smoother the gameplay – as long as your FPS (Frames Per Second) rate can keep pace with it. If that racing car were an enemy player in a competitive first-person shooter and you were firing upon it on a 60Hz monitor, you’d be shooting a target that’s not exactly where it appears to be since your display is refreshing the frames too slowly. So, not only does a higher refresh rate display provide you with a more responsive and enjoyable gameplay, but it also gives you a small advantage against other players in fast-paced games. As you can see, the difference between 240Hz and 144Hz is not nearly as noticeable as it’s between 60Hz and 120Hz+. So, if you’re a competitive gamer, we highly recommend getting a 144Hz or 240Hz gaming monitor. 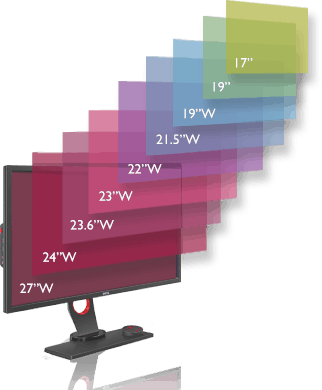 Some gaming monitors have a 75Hz refresh rate which offers a small but visible boost in motion clarity in comparison to 60Hz displays. There are also 100Hz-120Hz ultrawide gaming monitors that combine a high refresh rate with ultra-wide resolutions for both immersive and responsive gameplay. 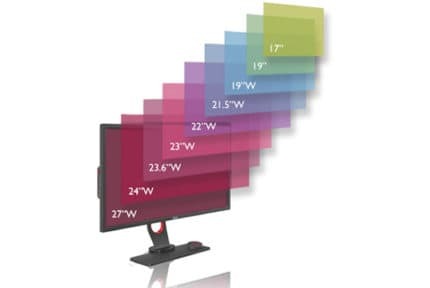 Ultrawide monitors have an aspect ratio of 21:9 as opposed to the widescreen format of 16:9. So, you get 33% more horizontal space for a more engaging gaming experience. In certain games, you get a wider field of view which can also be advantageous as you can spot enemies coming from the corners faster. However, some competitive games limit the aspect ratio to 16:9 just for that reason. In games that don’t support the 21:9 aspect ratio, you will have to choose between having black borders at the sides of the picture or having a stretched-out picture. Most of the newer games support ultrawide resolutions though. You can check out a list of all games that support 21:9 here and visit our best ultrawide monitors buyer’s guide for more information. There are also a few 32:9 ‘super’ ultrawide monitors available such as the Samsung C49HG90. There are three main panel technologies concerning monitors: TN, VA, and IPS – all of which have their advantages and disadvantages. While there are OLED monitors as well, currently, only a few are available and they are mainly intended for professional use and are expensive. Learn more about OLED monitors. Overall, TN monitors have the worst color reproduction and viewing angles meaning that the colors are somewhat washed out in comparison to IPS and VA while the picture shifts in contrast, color, and brightness when it’s looked at skewed angles. However, TN panels also have the fastest response time speed of only 1ms (GtG – Gray to Gray) which means that the pixels take only ~1ms to change from one shade of gray to another. This effectively removes ghosting, trailing, or motion blur of fast-moving objects which is why competitive gamers usually opt for this panel technology. Next, we have VA panels which boast the best contrast ratio which allows them to produce deep blacks for more vivid details in the shadows of the image and overall better relation between the darkest and the brightest colors. Alas, VA panels have the worst response time performance. Even at higher refresh rates, VA panels have noticeable ghosting that gets worse when there are mostly dark pixels involved in the picture. For most gamers, the amount of ghosting is tolerable as in return, you get such deep black tones. If you’re a competitive gamer and mostly play fast-paced games, however, you should avoid VA panels. Unlike TN panels, VA monitors have wide viewing angles of 178° though minor shifts in contrast are expected if you’re looking at the screen too far from the sides or below/above. 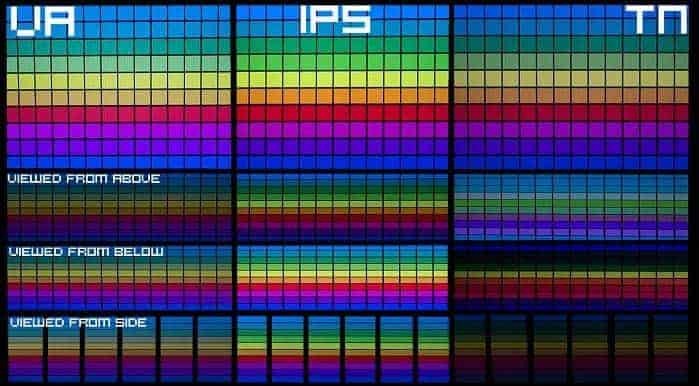 Lastly, there are IPS panels which have the most accurate and consistent colors although they don’t have as high contrast as VA panels. IPS monitors also have the best viewing angles while their response time performance is much better than that of VA panels but not as fast as it’s on TN models. So, you get vibrant colors as well as no prominent ghosting. The main issue users find with the IPS technology is IPS glow. IPS glow is a normal drawback of the panel; basically, as excess light passes through the panel, there is apparent glowing around the corners of the screen. The glowing is only bothersome if you’re looking at a dark image in a dark room, but even then, there are ways to manage IPS glow. If you want the best performance and would gladly sacrifice image quality for it, go with a TN panel gaming monitor. In case you don’t care for fast-paced and competitive games, VA monitors will provide you with the best viewing experience due to their superior contrast ratio. Lastly, IPS panels offer the most balanced picture quality and performance which is why they are the most popular option nowadays. Note that the monitor’s response time speed should not be confused with input lag which is measured as the time the monitor takes to register and display your commands. Unlike the response time speed, input lag is not specified by monitor manufacturers, so you will have to look for monitor reviews for more detailed information. Also, keep in mind that the response time specified by the monitor manufacturer is not to be taken literally. If an IPS monitor has a 5ms (GtG) response time listed in its spec sheet and a VA panel has 4ms (GtG), it doesn’t mean the VA model will have less ghosting and smearing. So, once again, you will have to rely on in-depth monitor reviews to ensure you’re getting the performance you want. Now that you’ve decided what screen size, resolution, refresh rate, and panel type suits you the best, you can look for certain features some gaming monitors offer. 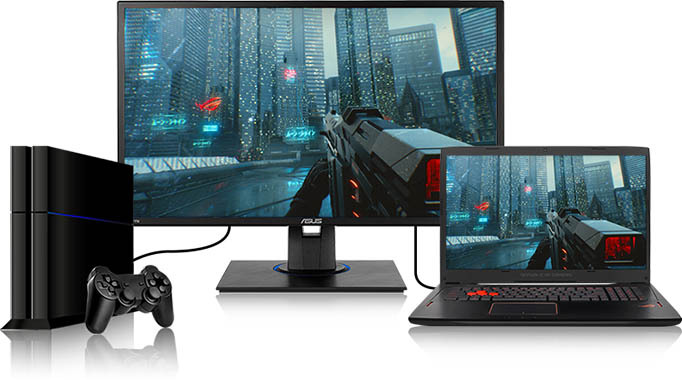 You’ll notice that some gaming monitors feature either AMD’s FreeSync or NVIDIA’s G-SYNC technology. Both technologies provide you with a variable refresh rate which allows the monitor to change its refresh rate dynamically and according to the GPU, therefore, eliminating visual artifacts such as screen tearing and stuttering without affecting input lag as VSync does. In order to enable this feature, you need a FreeSync-compatible AMD card for FreeSync monitors or a G-SYNC compatible NVIDIA graphics card for G-SYNC monitors. 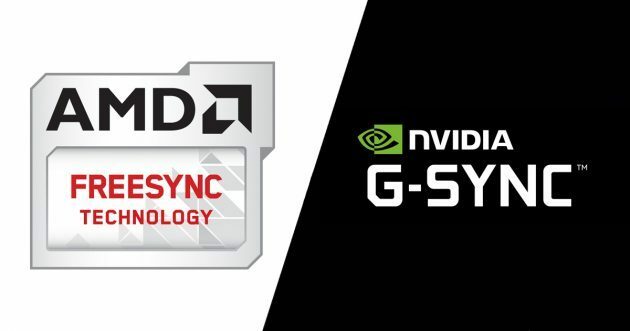 Some FreeSync monitors, however, are G-SYNC compatible and will work with compatible NVIDIA (GTX 10-series and RTS 20-series) cards as well. The difference between the two technologies is that G-SYNC monitors have an integrated module that ensures a wide dynamic refresh rate range and minimal input lag penalty but also significantly increases the monitor cost. FreeSync, on the other hand, doesn’t increase the monitor’s price as it’s based on a royalty-free standard. Moreover, FreeSync can work over both HDMI and DisplayPort depending on the monitor while G-SYNC works over DisplayPort only. The main advantage of G-SYNC is the wider dynamic range. For instance, all G-SYNC monitors have a variable refresh rate ranging from 30Hz up to the maximum refresh rate of the display, for instance – 144Hz. 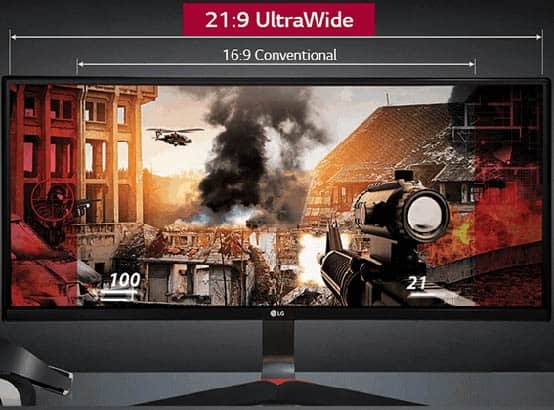 Most 144Hz FreeSync monitors would, in this case, have a dynamic range of 40-144Hz or 48-144Hz although there are exceptions where they have just as wide range as G-SYNC displays. It’s also possible to manually adjust the FreeSync range using CRU (Custom Resolution Utility) though your mileage may vary depending on the monitor. Lastly, if a monitor’s higher end of the FreeSync range is at least two times the minimum (for instance 50Hz-100Hz or wider – 49Hz-100Hz, etc), it also automatically supports the AMD LFC technology. LFC (Low Framerate Compensation) kicks in when your FPS rate drops below the lower end of the dynamic range. The display’s refresh rate then doubles or triples the GPU’s frame rates in order to maintain smooth performance. Some gaming monitors also support HDR which provides you with an increased brightness, contrast, and color gamut for compatible content. However, there aren’t many PC games that support HDR at the moment and there are several different ‘levels’ of HDR. 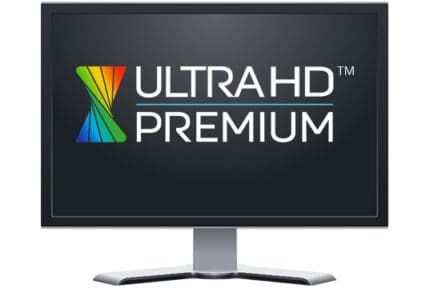 For instance, in order to truly enjoy HDR, a display should be capable of at least a 1,000-nit peak luminance, a minimum contrast ratio of 20,000:1, at least 90% DCI-P3 color gamut, and 4K UHD resolution. In order to achieve such high brightness and contrast, it will require an expensive full-array local dimming implementation which is available in a few high-end gaming monitors such as the ASUS ROG Swift PG27UQ. There are less expensive models which feature HDR support as well, but these can only deliver a glimpse of what HDR can truly do. 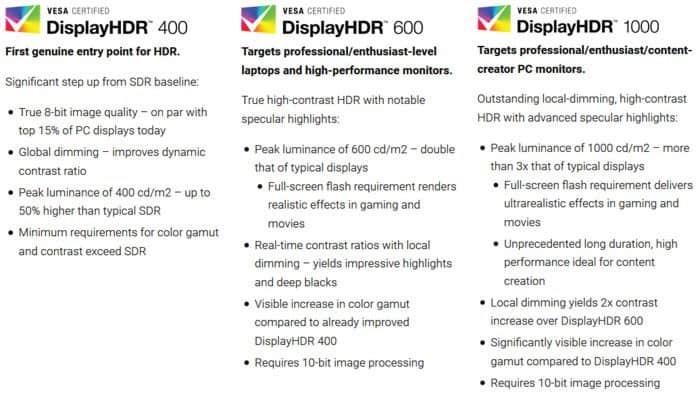 Most of the times, these HDR monitors will have VESA’s DispalyHDR certification (the image below) which clarifies the display’s capabilities. Overall, you should look for at least DisplayHDR 600 certification if you want a notable improvement over the standard image quality. 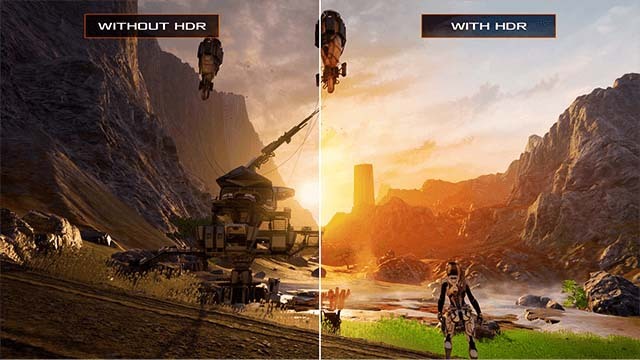 If a monitor supports both a variable refresh rate and HDR, it will most likely feature the second-generation of AMD’s or NVIDIA’s VRR technology. These technologies ensure minimal input lag when gaming with HDR enabled in addition to providing you with a variable refresh rate. Want CRT-like motion clarity? Look for a gaming monitor with a backlight strobing technology which is usually called something along the lines of 1ms Motion Blur Reduction (MBR), NVIDIA Ultra Low Motion Blur (ULMB), Extreme Low Motion Blur, 1ms MPRT (Moving Picture Response Time) etc. When enabled, these features strobe the monitor’s backlight which further decreases ghosting and trailing of fast-moving objects. Note that when this technology is enabled, the screen’s maximum brightness is decreased, so use it only when gaming. Furthermore, you can’t simultaneously enable FreeSync/G-SYNC and a blur reduction technology as in the latter case, the backlight needs to turn on/off at a fixed refresh rate. Curved gaming monitors are becoming more and more popular even though many considered them to be a passing fad. In the end, deciding between a curved or flat monitor comes down to personal preference. The curvatures range from 1500R (steep) to 3800R (subtle). With the exception of Xbox One S and Xbox One X which support 120Hz at 1080p and 1440p, consoles are limited to 60Hz. So, if you have a PS4, PS4 Pro, Nintendo Switch, etc, there is no need to go for a 60Hz+ gaming monitor unless you plan on using that monitor for PC gaming as well. In addition to the 120Hz support, Xbox One consoles (including the original Xbox One as well as Xbox One S and Xbox One X) also support AMD FreeSync. Check out our best console gaming monitors buyer’s guide for more information and the best deals currently available.